Work is keeping me quite busy over the last several weeks and blogging always drops off when this happens. I'm beginning a series of posts called Design Solutions that will address common design issues that often crop up when I work with clients.This is a great way for me to come to terms with options and at the same time it provides a written commentary that I can send clients to in the future. If I can help my readers in any way, it's a bonus. Being a lover of asymmetrical balance, I can't explain why I am so attracted to the placement of a bed between two windows. But I am. The windows become part of a larger design tableau in such instances, and the whole wall must be considered as a unit including headboard, night tables, lamps, table vignettes, art, window treatments and bedding. Here are several guiding principles to keep in mind. When you start with a layout that is symmetrical, it works best to continue using this form of balance in your design . The height and shape of your headboard will dictate what you place over it . When you have no headboard you have to choose something that will fill the space well, and circular shapes with lots of texture and warmth are brilliant. 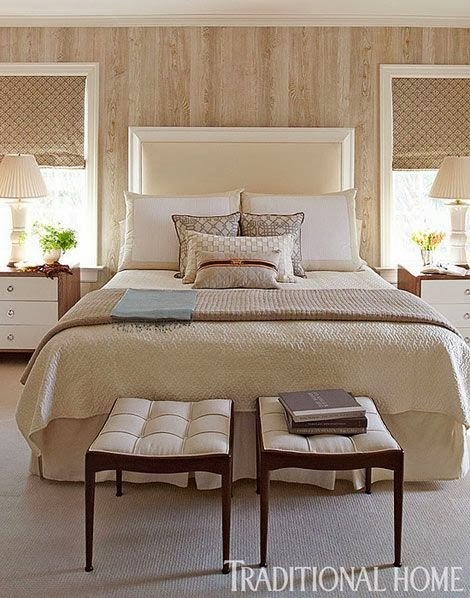 The pillows act as the center of interest in this layout of high headboard framed by draperies. No art is needed. Many designers are attracted to groupings of three objects (art) between two windows. This is an option, but not one I usually advocate. When there are too many rectangles my eye craves something curved or solid. In this room the art reaches the top of the windows filling the space in between thus making the windows, headboard, and art one large rectangle. This is a beautifully designed space, both elegant and simple at the same time. The headboard is low and the six art works fill the space nicely. It is always interesting how you can depend on one element or principle of design to negate problems with another one. With all the lines in the windows you might expect that 6 pieces of artwork would be overkill in this space. Not so here. The dark frames and lines in the romans make the window lines almost unnoticeable. Contrast always wins when vying for attention. The curves in the spectacular roman shades also provide some relief from all the rectangles. I rarely hang roman shades from the ceiling, but in this case it works especially well. 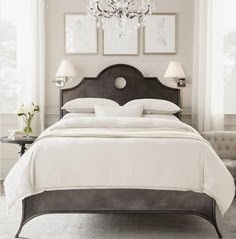 It is difficult to hang art over a curved headboard; it is often best to let the curves be the statement. 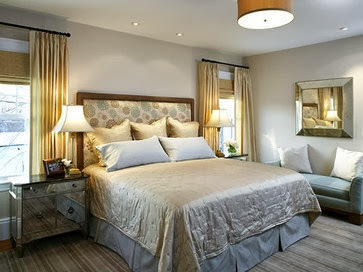 In this room a spectacular light fixture adds additional visual interest to the larger vignette. And the exception to the rule... there's always one! The lamps fill in the curves and the three pieces of art look especially good hung in a straight line. It doesn't hurt that there is a circle in the headboard. The art is light and the bed becomes the center of interest in the room. or use a round mirror or sculpture at the top of the curve. My preferred solution for a window treatment on matched windows is draperies. They soften all the hard edges and make great frames for the bed and the night tables. Think about your table colour when choosing your drapes. The tables should stand out not disappear. Yes, I would change the black, wrought iron rods! 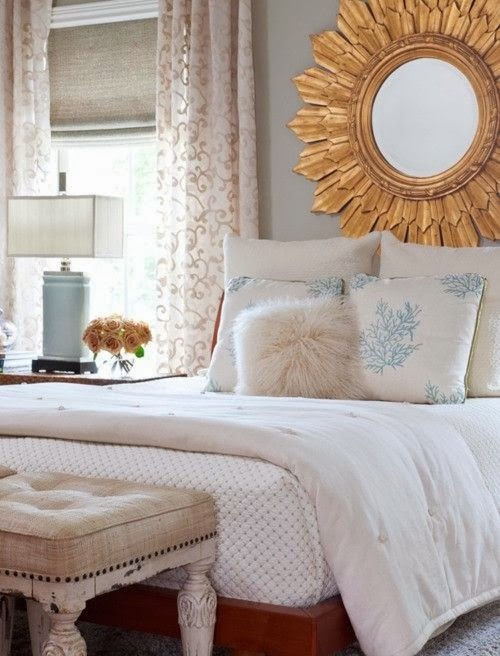 Love the simple pillow arrangement and circular mirror. Consider using blinds behind draperies for privacy. and be adventurous when mixing designs in the space. I think this combination works well because all the patterns have the same colours. Hanging a drape on the outside edge of both windows and using a shade of some sort is another option for a window treatment . This solution opens up a small room and gives the bed more room to breathe. The shades are the centre of interest in this room because they are so dark. Patterned fabric adds another element of interest. I love round night tables when there are two windows because they serve to soften all the straight lines. If you want to maximize visual space keep your shades and drapes light and matching. Be careful when you choose rods for your window treatment. Rods are functional and to my mind they should blend into the decor not make a statement that draws your eye upward. There's nothing else black in this whole room so why choose black rods? Check out a previous post on Choosing Rods. Romans are simple and linear. 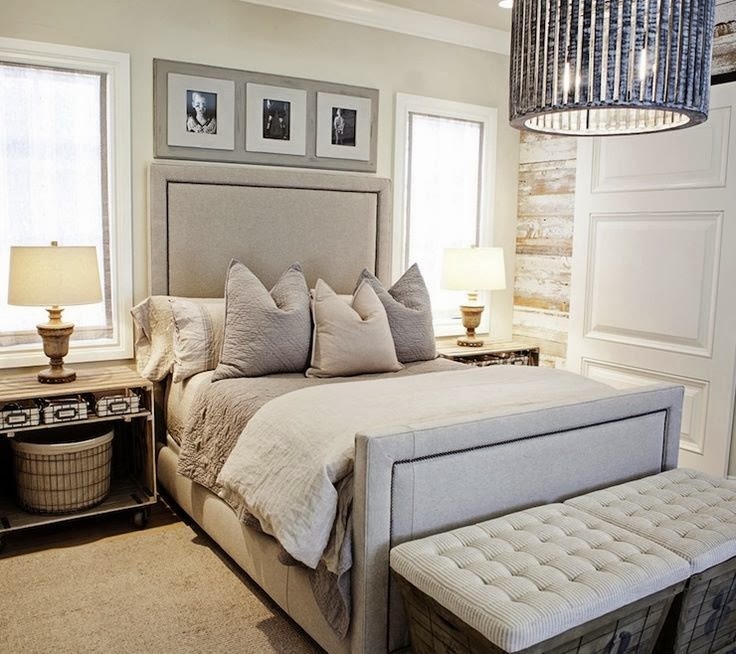 You would never call them soft, but they can frame a bed nicely when they are used in conjunction with tufted or other luxurious materials in a bedroom. By choosing a simple monochromatic scheme these romans serve to move your eye around the room and allow the white window details to frame the bed. The white art is a repetition of the the frames. 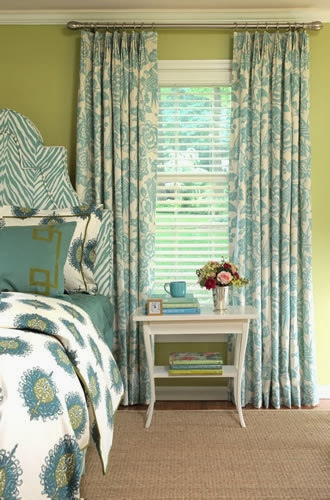 And why not make your window treatment the focal point in the room? Overload on draperies. My parting comments: This small monochromatic space maximizes design in every way. If you want to put three art pieces above the bed it works best when there are soft draperies on either side. 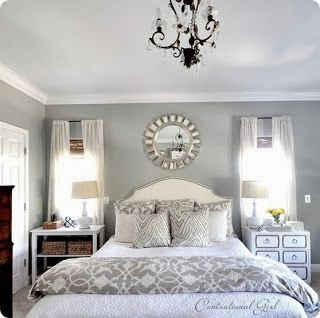 The simple images and large white borders connect with the white bedding and lamps. The larger white accessories are simple and perfect. The dark furniture anchors the space and I don't even mind the black rods! Links to all images can be found on my Pinterest board Bedrooms.